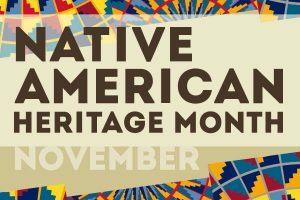 This month, our community will be celebrating a third cultural heritage “month”: Native American Heritage Month (NAHM). In 1976, President Gerald R. Ford proclaimed October 10th – 16th as National American Indian Awareness Week after a call to action by J.C. Elliott-High Eagle, a Cherokee Native American. On August 3, 1990, under the leadership of President George H. W. Bush, November was declared a commemorative month for Indigenous people in the United States. With the celebration of Indigenous Peoples’ Day on October 9th and the nationally recognized holiday of Thanksgiving in November, the celebration of Native American heritage and people is timed perfectly. Similar to shifting our language from Columbus Day to Indigenous Peoples’ Day, we’ve made a conscious decision to shift our language from Thanksgiving Break to Fall Break. While there is some debate about what to call this day since some refer to Thanksgiving as: Harvest Day, A Day of Mourning, Friendsgiving, A Day of Thanks, or simply Thanksgiving — we’ve chosen “Fall Break” to both be intentional about our language use and to acknowledge the genocidal aspects of the history of Thanksgiving as celebrated in our nation. We encourage you to take time to explore the untold stories of our history and to look beyond the myths that have been perpetuated about the relationship between English settlers and Native American people. As November comes to an end and we near the start of our Fall Break, we call on the entire MMFS community to use the break to be reflective. We hope you will take time to honor and acknowledge Indigenous people, their contributions to society, and their history. As a school, we will continue our celebration through the use of bulletin boards, silent meeting queries, journal prompts, field studies, curriculum integration, resource sharing, and school-wide announcements with facts about Native American heritage.